These Chocolate Drizzle Christmas Cookie Sticks are pretty and festive, and they are so easy to make! When the holidays roll around, I can’t wait to start baking up yummy treats like these cookie sticks, M&M Chocolate Cookies, and Dipped Gingersnaps! I’ve posted dozens of cookie recipes, but this is the very first time I have ever made any type of cookie sticks. My goodness, I have sure been missing out. I couldn’t believe how easy these were to prepare, and how fabulous they taste! They start with a simple chocolate chip cookie dough. But the magic happens when you roll them out and cut them into little strips. I used a dough scraper, and it worked perfectly. After they are cut, just place them on cookie sheets. I always line mine with silicone pan liners because it makes clean up so much easier. -Some people have said the dough is too dry. You MUST use butter that is almost melted, or your dough will be too stiff. -You can use less flour if you prefer, but then the cookie sticks spread more and don’t look as pretty. 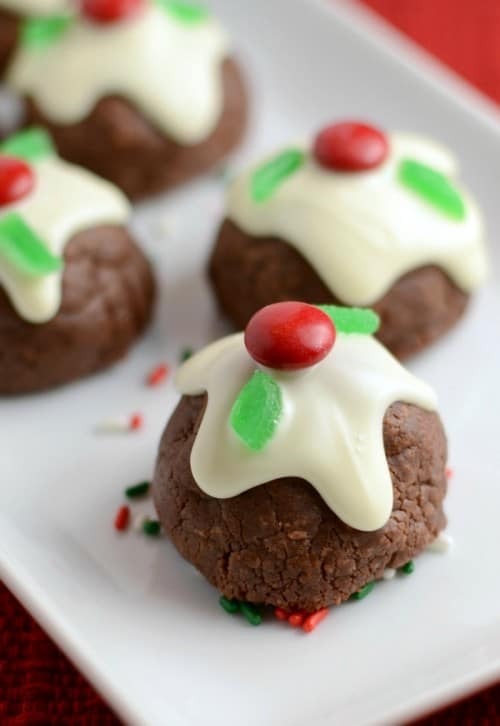 -Mini chocolate chips work best for this recipe. If all you have is regular chocolate chips, I recommend chopping them up. These little guys are pretty tasty straight outta the oven. They are even prettier and tastier drizzled with a little chocolate. But add two layers of drizzled chocolate and some sprinkles, and they are downright fabulous! 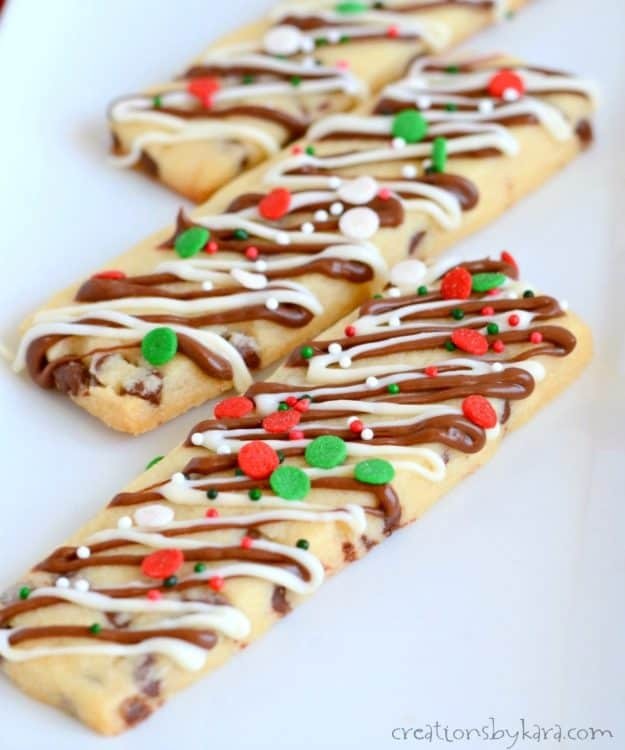 These chocolate drizzled cookie sticks would look so pretty on a Christmas cookie tray. They are just so festive. And of course with chocolate chips and two kinds of drizzle, they are absolutely delicious! And of course, they are the perfect shape for dunking. 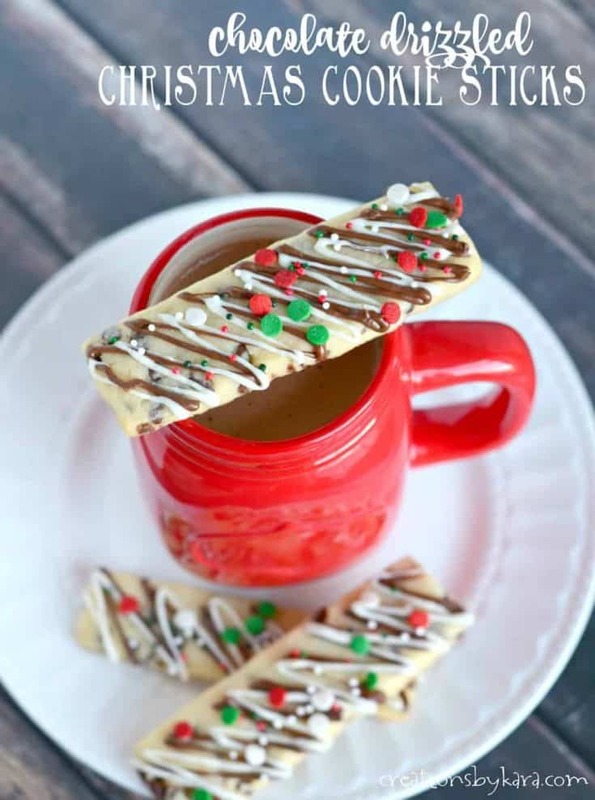 For an extra special treat, you can dip them into hot cocoa. So yummy! 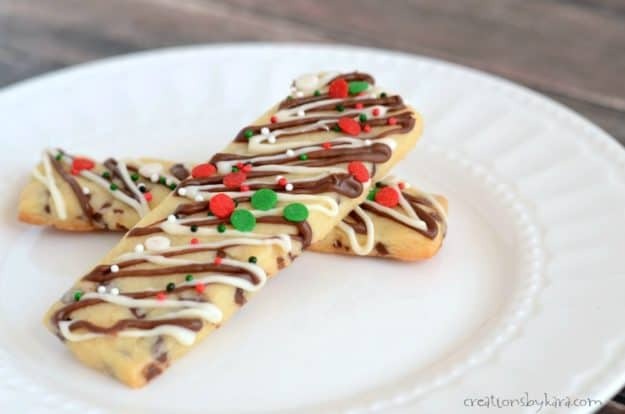 Festive chocolate chip cookie sticks with chocolate drizzle and Christmas sprinkles. Cream butter and sugar in a large mixing bowl. Beat in egg, vanilla, and almond extract. Stir in the flour, baking powder, and chocolate chips. Cover dough and chill for at least 30 minutes. Roll dough out on a lightly floured surface to a rectangle shape that is about 1/4" thick. Use a knife or pizza cutter to cut the dough into strips that are about 1" by 4". Place strips on parchment lined cookie sheets and bake at 375° for about 8-10 minutes or till lightly browned on the bottom edges. Let sit on pans for a couple minutes, then remove to cooling racks. Cool cookies completely. Melt each of the chips in a ziplock bag in the microwave at half power. Snip the corner and drizzle over the tops of the cookies. Add sprinkles. -Your butter must be almost melted, or the dough will be too stiff. You must also make sure to use a large egg, and don't emit the extracts. You can use only 2 3/4 cups of flour for a softer dough, but the cookie sticks will not hold their shape as well. 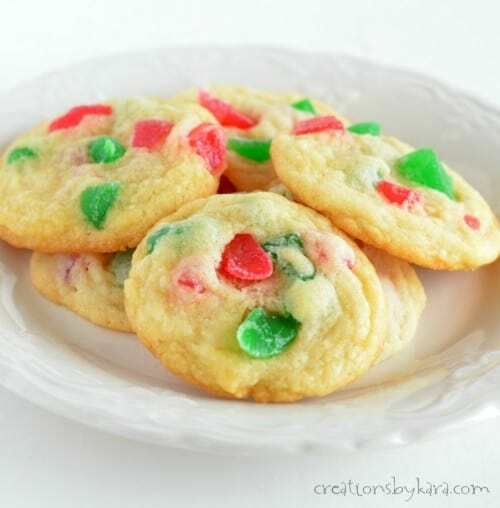 -It works best to drizzle a few cookies at a time so that you can add the sprinkles before the chocolate sets up. 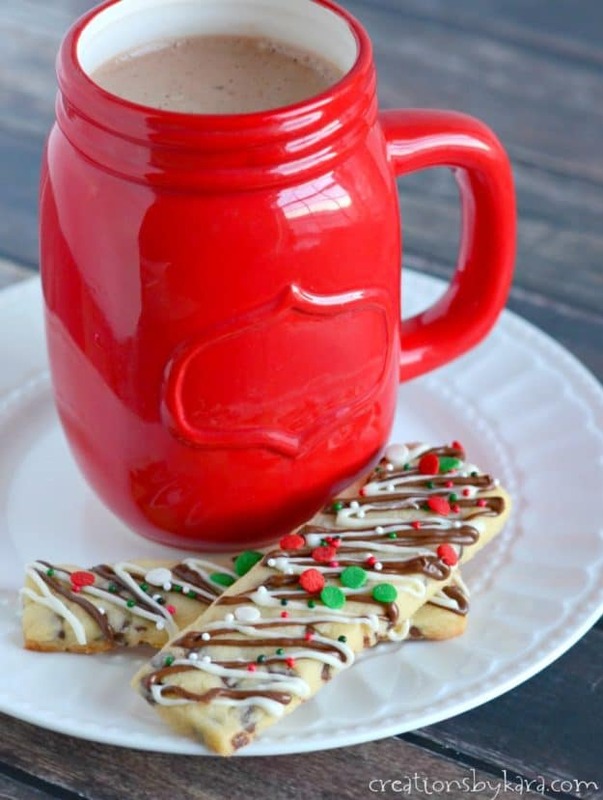 I originally posted this recipe for Christmas Cookie Sticks at Tatertots and Jello. 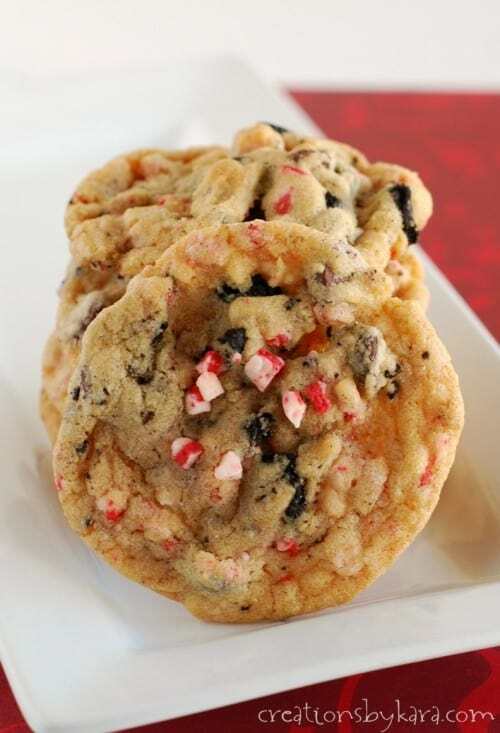 For all my cookie recipes, click HERE. How many sticks will this recipe make? Thanks. Depends on the size, but I got about 4 dozen. Just finished making these and they turned out fantastic. They look so very festive! 🎄🎄🎄 Thanks for sharing this recipe! What a fun recipe! I chilled the dough for an hour and a half and it rolled out like a dream! I have 8 year old twins coming for a visit after school tomorrow and they will love their special sticks!! Sorry I can’t send a photo but they look so good. Glad they turned out perfectly! Hope you had a fun day with the twins! These cookies came just like the pictures…they were easy to make, just a lot of steps. Dough was easy to work with, I think the key was the almost melted butter. They are a great add to my Christmas cookie collection. I would like to make these, but need to know if they can be frozen? Has any one frozen them yet? I haven’t frozen them, but I think that as long as you freeze them before drizzling them with chocolate, they should be fine. Almost like a biscotti but without the fuss of twice baked. Thanks for this. These are SO cute and unusual! For that reason, I am making them for my blog and will of course site you as the source. They are just so fun looking! These turned out great, very easy but looks impressive! Making with Valentines sprinkles for my son’s school bake sale; thanks for sharing. I love that idea. I bet they turned out so cute! I just made these cookies. So easy, delicious and pretty. Very confused by negative comments, because I am just an OK baker and these were perfect! Thanks for the recipe! Yay, I am so happy to hear it! I’m not sure why some people have had trouble. These were great.. followed recipe to the letter all was well..
found them to be more like a shortbread cookie and that’s fine.. they look great!& taste great.. Followed directions to the point, and they came out perfect! Love the way these look on my cookie platters. Loved these cookies it was a bit of a challenge but patience won over. I took only about 1/3 of the dough at a time slowly rolled them out used a ruler as a guide and cut along the edge of it and they cut perfectly. I got quite a few more than supposed to but guess they are thinner . Glad you liked them. Using a ruler is a great idea! I don’t understand the problem that some have had with this recipe. My dough was easy to work with. The cookies were flavorful, with Vanilla and Almond, both present notes. 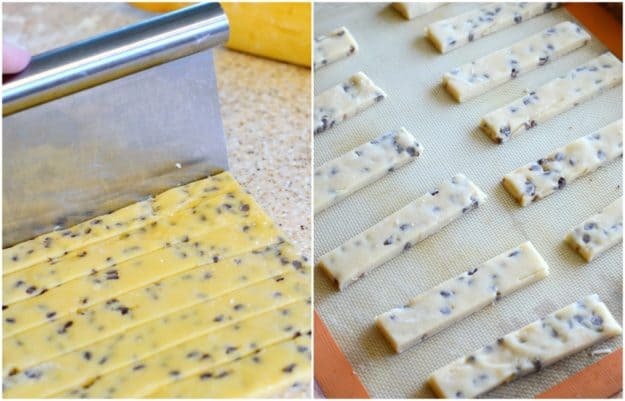 Chocolate chips are present in many bar type cookies, they cut quite easily. The cookies are also very pretty and tasty as baked and decorated. I make more than 25 different, widely loved cookies in my Christmas cookie tray, and these has been well received. Made these last week with Dominican Republic’s Delifruit Vanilla Blanca. Its a very distinctly strong vanilla flavour. Hubby loved them, but preferred them without the drizzle and sprinkles. Making more now. This recipe is terrible. I had to throw everything away. Gross. Super dry and crumbled would not even form into a dough. Please don’t waste money and time on this lady got ratios wrong or something. Definitely too much flour! I agree with Claire and Kristan. Used less flour, about 2 1/2 c., still dry and pretty tasteless, considering all the flavoring. Could not roll the chilled dough. Had to bring it back almost to room temp. And chop it out of the bowl. It is hard to cut straight because the mini chips get in the way. Difficult dough to work with. Will not make again. Not worth the considerable amount of putzing involved. One star. I find your review quite surprising. I made these according to the recipe with no problems whatsoever! Super easy and delicious. So sorry they didn’t turn out well for you, I have never had that problem. My guess is that your butter wasn’t soft enough. It should be almost melted, or the dough will be too stiff. You can add less flour, but then they spread more when baking and I don’t think they turn out as pretty. 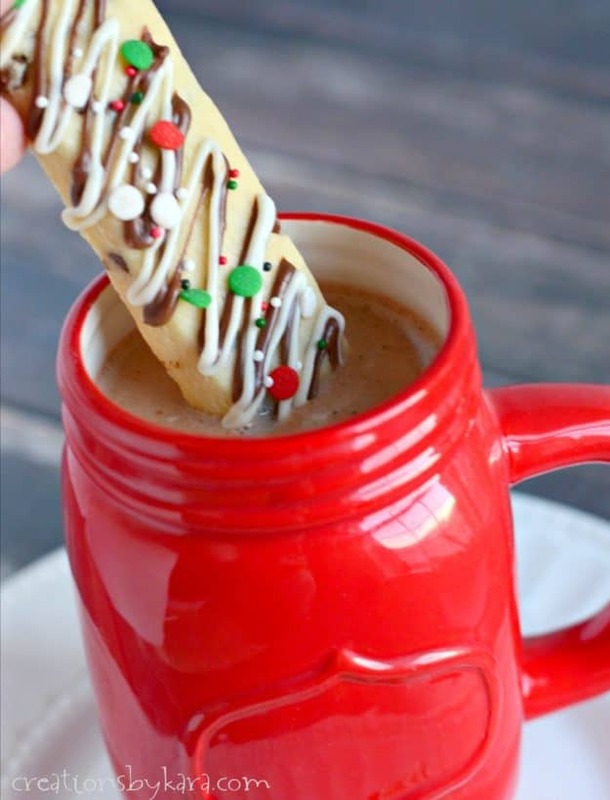 I love the idea of doing cookie sticks to dip in your hot chocolate, tea, or eggnog! I didn’t think of dipping them in eggnog. Yum! !